This fat-free, easy-to-make Weetabix cake sounds too good to be true doesn’t it? Well, I promise you it isn’t. It doesn’t even require a lot of mixing–it’s that easy. Really, Mr. Weetabix does the hard work here, acting as a superb glue for the rest of the ingredients (so you need no butter), he adds a delicious taste and a high dose of fiber too. No cake is ever going to be classed as a health food, but if you’re going to have a cake then at least make a healthier version. A slice of this will fit in your lunchbox just perfectly. 1. 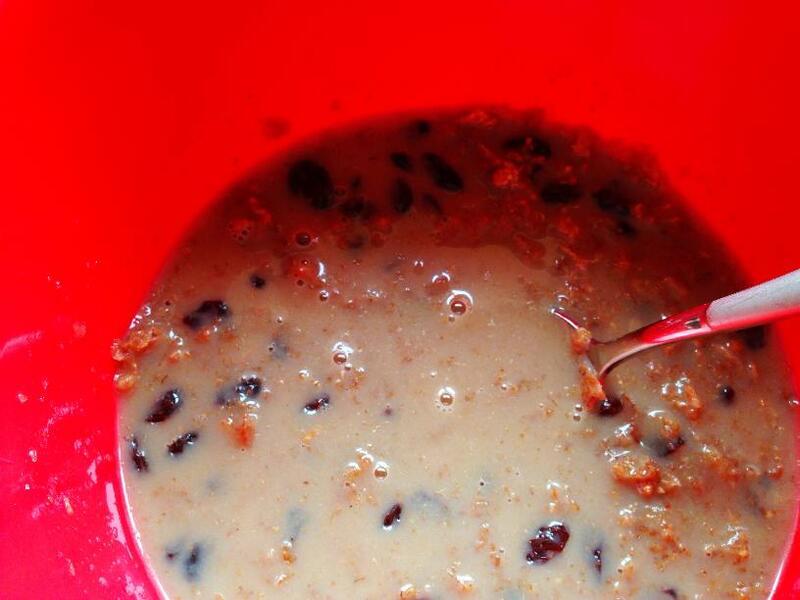 Put the Weetabix, dried fruit, sugar, and milk into a bowl. Break up the Weetabix a little, with a spoon, and stir it all together. Cover the bowl with cling film and leave it in the fridge for at least 3 hours or overnight. 2. Preheat the oven to 180c, 350f, gas 4. 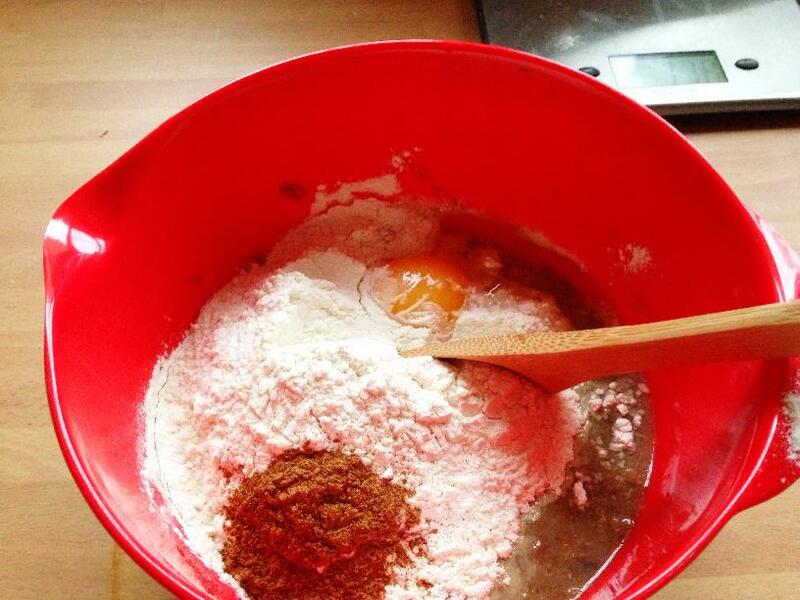 Put the other ingredients into the bowl with your Weetabix mix and stir it until everything is mixed in. 3. 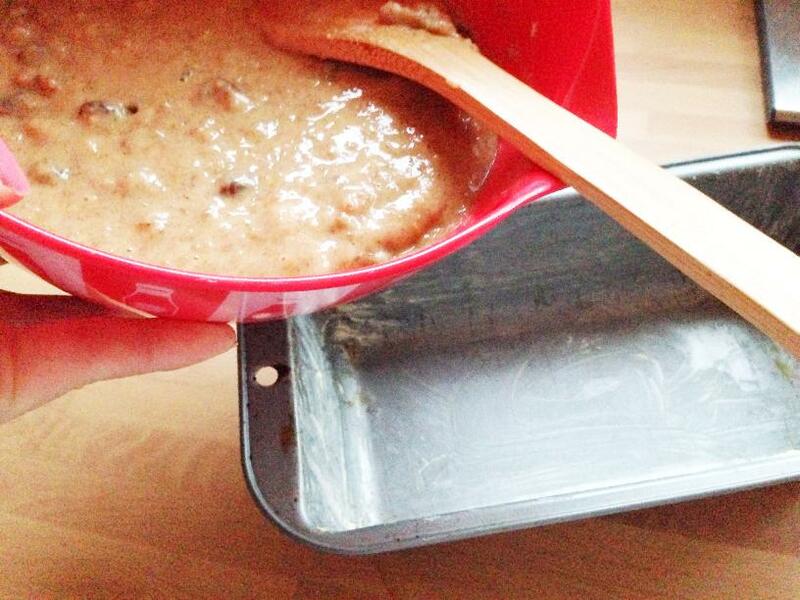 Pour the mix into a greased loaf tin, and cook for 50 minutes. And that’s it–just three steps! You’ve made your fat free, high fibre cake. Now all that’s left to do is enjoy it. 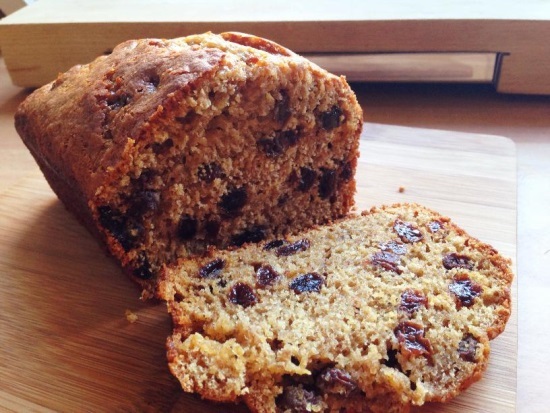 You can easily make 2 of these and freeze one for later–Weetabix cake freezes really well. What’s the Big Deal with Fibre? So, you probably hear a lot about why fibre is so good for us, but you don’t really know why. Well, probably most grown-ups don’t either! To understand better, let’s take a look at how our bodies process the food we eat. Once food reaches our stomach (tummy) it next gets sent to the small intestine. The small intestine processes our food, and anything that can be absorbed into our bloodstream gets taken care of here–such as sugar, for example. Anything that our body can’t absorb then gets sent on to the large intestine. 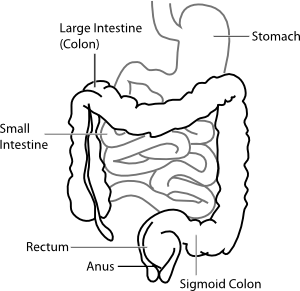 The large intestine processes what is left of the food that our body can’t use, and it turns it into… well… poop. Fibre travels through both the small intestine and the large intestine, making sure they stay clean–this helps to keep our insides nice and healthy. If you eat a good amount of fibre, then when it’s time to go to the toilet, fibre makes it easier for you to… well… poop. So, as you can see, fibre is a really important thing to have in our diets. Where is the Fibre in Weetabix Cake? 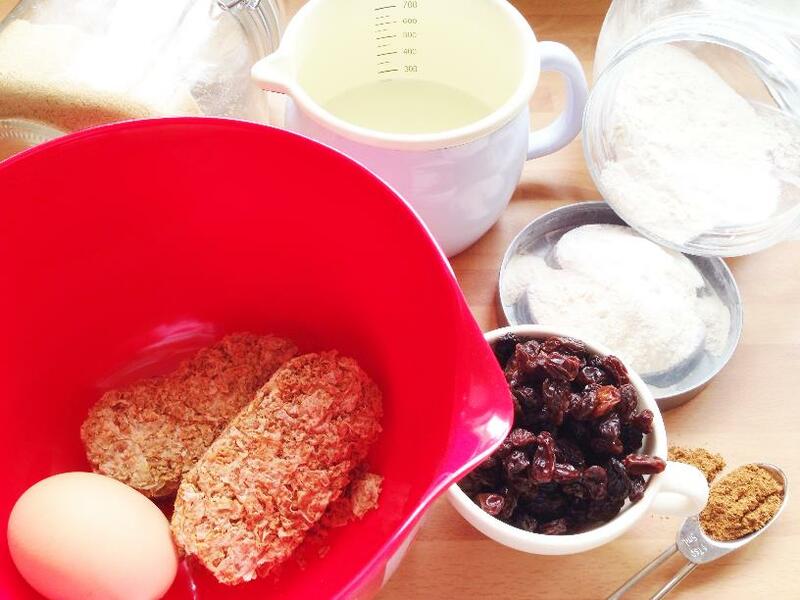 In our Weetabix cake, the Weetabix itself has a good amount of fibre, and the dried fruit (sultanas, raisins, etc.) is a good source of fibre too. So these foods aren’t only yummy they are good for our bodies too! If you enjoyed the Weetabix cake you made then please share this post and let your family and friends know. Hi Liz, you’ll see in part 2 it says “add other ingredients”. There isn’t a video. It’s clearly in the picture on step 2 and is clearly stated in the text when to add the egg. As stated previously, step 2 says “add other ingredients” so this would be where you add egg. It would be very useful if you could kindly mention how many syns the cake comes to. I make the dried fruit alone to be 17.5 syns not to mention the flour, sugar etc. I know the cake is cut into slices and portions but it really would help to know this before cooking. The cake looks lovely, I must say. Hi Irene, thank you for your comments. Yes it is a lovely cake. Unfortunately I will not be adding information like syns to any of my recipes. There are a few reasons for this but the main one is that obviously this is a cooking website for kids, who don’t, and shouldn’t, care about diets and syns. This recipe wasn’t intended to ever be a ‘diet’ recipe, although obviously the beauty of making things yourself is that you have a list of the ingredients and relevant quantities to be able to work out syns, calories, points or whatever you wish to. Many thanks, and I hope you do try the cake at some point. Thank you! If be interested to see how the cake with sweetener turns out. That’s a great idea. Brilliant, thanks Mandy. I love making the big reveal to people that it’s got Weetabix in it ? Oh also, my partner gave a slice to a work colleague, and he’s asked me to make him one but without the fruit! So, do I just make it the same but leave the fruit out or do I need to increase something else? I know someone who regularly reduces the sugar in recipes by a third as a matter of course so that’s interesting to know that it works in this recipe. Thank you. I’ve honestly never tried it without the fruit but I imagine it will still turn out the same. The fruit does add some sweetness though. Let me know how you get on. I have no idea. This isn’t a Slimming World website it’s a kids cooking website. 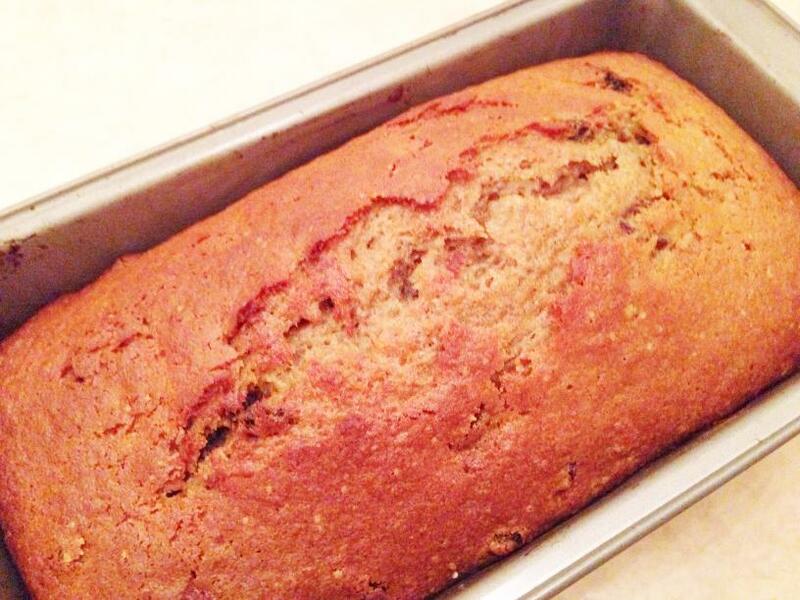 Hi many thanks for sharing this recipe, it looks delicious and I’m sure my husband will enjoy tasting this, I don’t like fruit cake myself but I do enjoy baking and trying new recipes out on him. I feel sure that if people are so ‘hung-up’ on syns, diets etc., then they should read all the information you have kindly provided, instead of asking endless questions. I look forward to trying this cake out over the weekend and again many thanks for sharing. Does self raising flour have baking soda or baking powder in it ? Baking soda/ baking powder ? Thanks !!! Great question, Mary, thank you. Self-raising flour is all-purpose flour with baking powder added. So for one cup of all purpose I would add two level teaspoons of baking powder. I’ll update the recipe too as I don’t often use self raising nowadays either. Hello it says over for 50 mins. Is it 200*? Just made this and found it much too sweet. Should have read the comments about reducing the sugar which I will do next time.